The PSO-1 (Pritsel Snaipersky Optichesky, "Optical Sniper Sight") is a telescopic sight manufactured in Russia by the Novosibirsk instrument-making factory (NPZ Optics State Plant) and issued with the Russian military Dragunov sniper rifle. The PSO-1 was, at the time of its introduction around 1964, the most technically advanced telescopic sight ever designed for a mass-production designated marksman or sniper rifle. The PSO-1 was specifically designed for the SVD as a telescopic sight for military designated marksman activities. The current version of the sight is the PSO-1M2. This telescopic sight is different from the original PSO-1 only in that it lacks the now obsolete infrared detector. The metal body of the PSO-1 is made from a magnesium alloy. The PSO-1 features a battery-powered red illuminated reticle with light provided by a simple diode bulb. It features professionally ground, fully multi-coated optical elements, a baked enamel finish for scratch protection, and an attached, quick-deployable, extendable sunshade. The scope body is sealed and filled with nitrogen, which prevents fogging of optics and was designed to function within a -58 °F to 122 °F temperature range. For zeroing the telescopic sight the reticle can be adjusted by manipulating the elevation and windage turrets in 0.5 mil or 1.72 MOA increments. Considered the higher end of Soviet military side-mount telescopic sights, the quality of the PSO-1 is higher than most other PSO-style telescopic sights. The PSO-1 has neither a focus adjustment nor a parallax compensation control. 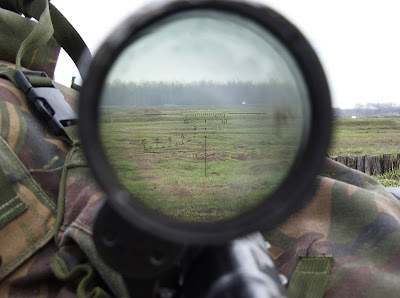 Most modern military tactical scopes with lower power fixed magnification such as the ACOG, C79 optical sight or SUSAT (intended for rapid close-intermediate range shots rather than long-range sniping) lack such features as well. Modern fixed magnification military high-end-grade sniper telescopic sights scopes intended for long-range shooting usually offer one or both of these features. The positioning of the scope’s body to the left of the bore’s center line may not be comfortable to all shooters. The PSO-1 elevation turret features bullet drop compensation (BDC) in 50 m or 100 m increments for engaging point and area targets at ranges from 100 m up to 1,000 m. At longer distances the shooter must use the chevrons that would shift the trajectory by 100 m per each chevron. The BDC feature must be tuned at the factory for the particular ballistic trajectory of a particular combination of rifle and cartridge at a predefined air density. Inevitable BDC-induced errors will occur if the environmental and meteorological circumstances deviate from the circumstances the BDC was calibrated for. Marksmen can be trained to compensate for these errors. Besides the BDC elevation or vertical adjustment control of the reticle, the windage or horizontal adjustment control of the reticle can also be easily dialed in by the user without having to remove turret caps etc. The PSO-1 features a reticle with "floating" elements designed for use in range estimation and bullet drop and drift compensation. The top center "chevron" (^) is used as the main aiming mark. The horizontal hash marks are for windage and lead corrections and can be used for ranging purposes as well. To the left is a stadiametric rangefinder that can be used to determine the distance from a 5 ft 6.9 inch tall object/person from 200 m (2) to 1000 m (10). For this the lowest part of the target is lined up on the bottom horizontal line. Where the top of the target touches the top curved line the distance can be determined. This reticle lay out is also used in several other telescopic sights produced and used by other former Warsaw Pact member states. The three lower chevrons in the center are used as hold over points for engaging area targets beyond 1,000 meters (the maximum BDC range setting on the elevation drum). The user has to set the elevation turret to 1,000 meters and then apply the chevrons for 1,100, 1,200 or 1,300 meters respectively. The 10 reticle hashmarks in the horizontal plane can be used to compensate for wind or moving targets and can also be used for additional stadiametric rangefinding purposes, since they are spaced at 1 milliradian intervals, meaning if an object is 5 m wide it will appear 10 hashmarks wide at 500 m.
The reticle can be illuminated by a small battery-powered lamp. The SPP (1OP50) and SPP-M machine gun sights are designed for aimed firing during daylight hours from the NSV-12.7 and Kord machine guns at a distance of up to 2000 m, as well as at dusk and at night with the reticle illumination on. The SPP sight was used as a base for development of a higher power sight SPP-M. which, apart from machine guns, can be installed on sniper rifles. 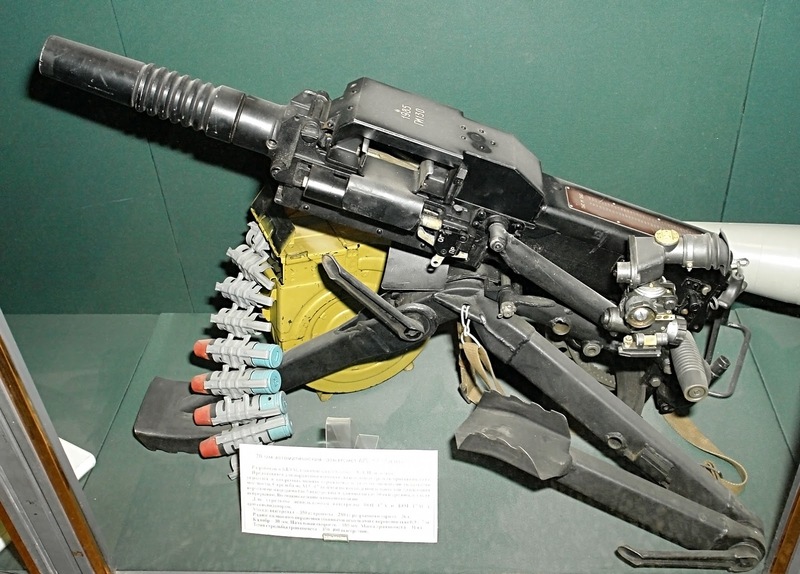 The SPP sight for the Utes (NSV-12.7) heavy machine gun was developed by designers L. A. Glyzov and V. M. Kotov in 1972. 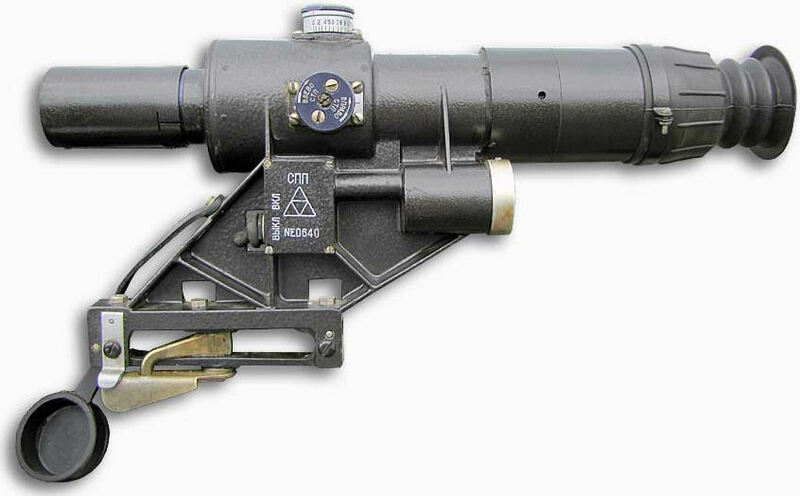 The main task of the machine gun is to fight soft targets at ranges of up to 1500-2000 m. The sight features variable magnification to meet two conflicting objectives: on the one hand, it is necessary to keep a check on as wide of a field of view as possible (12° at a magnification of 3х), and on the other hand, improvement of the efficient firing range requires a higher power (6 at a field of view of 6°). The magnification is changed by simultaneous movement of the erecting system lenses along the optical axis according to the Saw set by a mechanical cam. Illumination of the aiming reticle and the remote power supply system are arranged similarly to the PSO-1 sight. To determine the target range, the sight uses the "base on target" distance measuring technique. The ranging scale within the field of view of the sight provides a means to take the range using a full-height figure target (5 ft 6.9 inchs) at a distance of up to 1000 m.
the sight can be used at a temperature from minus 50°C to plus 50°C. The SPP sight was put into service in 1972. Manufactured by NPZ Optics Stale Plant. The automatic grenade launcher sight PAG-17 is an optical sight that serves for targeting the AGS-17 grenade launcher when firing at targets at different distances. The sight of the PAG-17 is intended for aiming an automatic grenade launcher when firing both direct guidance and from closed positions. For this purpose, the sight is provided with a goniometric mechanism and a mechanism of elevation angles for guidance in the horizontal and vertical planes. There are two levels for controlling the roll and the angle of elevation of the grenade launcher. The sight is also equipped with illumination of the aiming grid and scales of targeting mechanisms for aiming at night time. The sight consists of a body in which a protractor and the mechanism of elevation angles and heads from an optical system are assembled. The body serves to connect all parts of the sight. It has an axis of sight with an oval recess and a pin to attach the sight to the grenade launcher; A bar for fastening the cartridges of the illumination of scales and levels. The longitudinal level serves to control and deliver the grenade launcher a given elevation angle when firing from a closed fire position. The head of the sight is used for sighting on the target (point of focusing) in it an optical system is assembled. There is an eyepiece on the head; On the left - a sight and a point for direct guidance for grenade launchers in case of damage to the optical system; On top - the base for attaching the lamp holder of the sighting grid; Front on the rim - two screws for fixing the light filter. The optical system of the sight consists of an objective, a prism, a grid, an eyepiece and protective glass. The lens is intended for obtaining images of the observed object. The prism is a wrapping system and serves to obtain a real direct image. The eyepiece serves to increase the viewing of the image of the observed object and the grid. Protective glass protects the sight from getting inside dust and dirt. Through it, the grid of the sight is illuminated. The mesh of the sight is a plate on which the scales of the angles of sight and lateral corrections are plotted.